Length 600mm, Blade bedded 45d. Adjustable mouth minimizes tear outs..
Shaving flow freely because there is no wedge..
Lignum vitae sole is self -lubricating and wear resistant.. Plane body is select fruit wood. 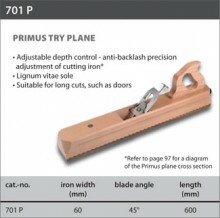 Click the button below to add the Primus Try plane to your wish list.